Jack Ü is an American DJ duo, side group and collaborative project, consisting of Mad Decent founder Diplo and OWSLA founder Skrillex, formed in 2013. They are an EDM act with no specific genre, releasing a variety of genres from trap to house to dubstep. Jack Ü performed at Ultra Music Festival Miami in 2014. They released their first official single "Take Ü There" featuring vocals from Kiesza on September 17, 2014. Skrillex commented of Jack Ü that he and Diplo will "feature on each other's tracks, and put out some singles together, but mostly we Diplo and Skrillex just like to DJ together as Jack Ü." On February 3, 2015, the pair announced that they would be working with Missy Elliott on a remix to "Take Ü There". Jack Ü's debut performance took place at the Mad Decent Block Party in San Diego on September 15, 2013, which is a nationwide tour that record label Mad Decent puts together in order to showcase different artists signed to the label. Diplo announced the project by releasing the Mad Decent Block Party lineup with Jack Ü playing at multiple stops on the tour. After some guessing by many of who "Jack Ü" was, Diplo finally came out to reveal that "Jack Ü ... means Skrillex and Diplo together". The two have worked with each other on assorted projects over the past five years starting with Skrillex singing and playing guitar on a record for Major Lazer, one of Diplo's other projects. In 2011, Diplo also worked on a song with Skrillex titled "Amplifire" (though it was never completed or released) for Bangarang. They collaborated on a song that combines trap and dubstep elements and features vocals from Korean pop artists CL and G Dragon titled "Dirty Vibe" for Skrillex's album Recess. When asked about how the two ended up forming Jack Ü, Diplo stated that Skrillex "was one of the first producers I met when I moved to LA...we just have always been really close musically with our ideas." The two get together in Downtown L.A or in hotel rooms when on tour to make their songs. 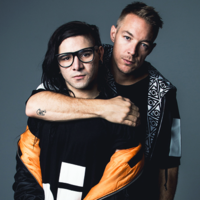 On March 30, 2014 Jack Ü was given an hour-long slot to play at the Ultra Music Festival. The set included a wide variety of genres featuring songs from Skrillex's then newly released first studio album, Recess, and including some old school hip-hop with DJ Kool's "Let Me Clear My Throat". On December 31st, 2014 Jack Ü headlined a concert at Madison Square Garden. Besides their (Diplo and Skrillex) performance, other performers included A$AP Ferg, Diplo, Skrillex, Rudimental and Yellow Claw. The concert was broadcast live on Yahoo. On September 1, 2014, Seth Troxler, an underground house and electro producer, was set to play his set at the Robot Heart stage at the Burning Man Festival. However, due to some of his entourage not being allowed join him behind the DJ decks, Troxler refused to play. Those in charge of the Robot Heart stage needed someone to fill in for Troxler and they asked Skrillex to help. Skrillex played for about half an hour before inviting Diplo to come onto the stage for them to perform as Jack Ü for the rest of the set. Some of the Robot Heart crowd were unhappy, because Skrillex and Diplo are mainstream producers, and the Robot Heart stage is more about underground artists and songs. To finish up their set Diplo mixed the song "Africa" by Toto into DJ Snake and Lil Jon's platinum record "Turn Down For What" as "an inside joke". Rumors later surfaced that the two were booed off the stage and forced to end their set early due to playing "Turn Down For What" at a stage that was meant for underground music. Diplo linked to a long statement on his twitter, saying that "there was no booing... no bad vibes... Everything we did there was good fun and all the people that attended know it"..
Jack Ü's debut single, "Take Ü There", was released on September 17, 2014. In an interview with Zane Lowe of BBC's Radio 1 station, Skrillex explained that the making of this song had a unique process. They were set to play a show in Ibiza, Spain when they saw Canadian pop singer Kiesza perform ahead of them. Impressed with her singing, they asked her to do the vocals for a song. They recorded her in their hotel room and finished the song in one night. During a set at Camp Question Mark of the Burning Man festival (one of eight different sets they played over the course of the festival), the duo played "Take Ü There" along with an unreleased track titled "To Ü", of the electro and future bass genres, featuring vocals from AlunaGeorge, and "Beat Steady Knockin'", which features vocals by New Orleans bounce artists Fly Boy Keno. Recently on the BBC channel 1Extra, Jack Ü played numerous unreleased tracks in a two hour takeover mix including "Febreeze (featuring 2 Chainz)", "Jungle Bae", "Cumbia El Cuco (featuring Maluca)" and a new collaboration with SNAILS called "Some of Them". Diplo has also discussed an upcoming Jack Ü mixtape, however currently no official release date has been announced. Skrillex has also mentioned that Jack Ü has "got five songs that we made that aren't even released, and we'll end up releasing in 2014".